Rosenbergite: Mineral information, data and localities. May also be given as AlF3·3H2O. Named in 1993 for Philip E. Rosenberg (b. 1931), geochemist at Washington State University, USA. He was the first to take note of the mineral. The Al analogue of topsøeite. A hydrated counterpart of oskarssonite. Found as aggregates of minute colorless crystals. Compare 'UM1988-02-F:AlHO' (a lower-hydrate counterpart) and 'Unnamed (Basic Aluminium Fluoride Monohydrate)'. Tetragonal prisms approx. 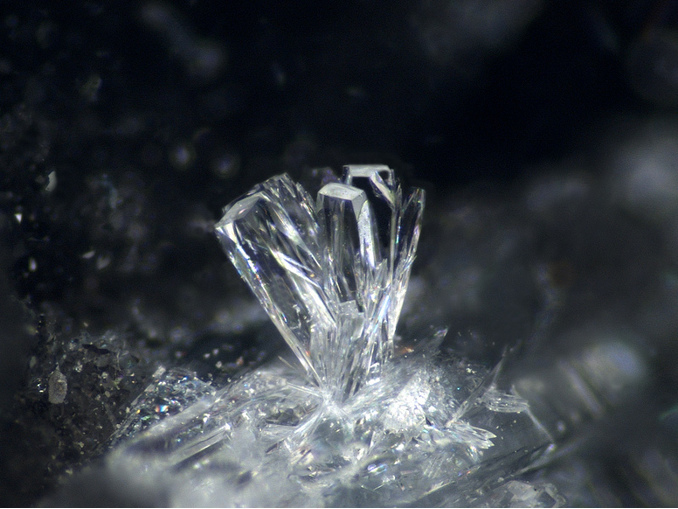 0.25 mm in size; found as aggregates of microscopic crystals. Olmi, F., Sabelli, C., Trosti-Ferroni, R. (1993) Rosenbergite, AlF[F0.5(H2O)0.5]4•H2O, a new mineral from the Cetine Mine (Tuscany, Italy): description and crystal structure. European Journal of Mineralogy: 5: 1167-1174. Gypsum 1 photo of Rosenbergite associated with Gypsum on mindat.org. Gaines, Richard V., H. Catherine, W. Skinner, Eugene E. Foord, Brian Mason, Abraham Rosenzweig, Vandall T. King (1997) Dana's New Mineralogy : The System of Mineralogy of James Dwight Dana and Edward Salisbury Dana: 390. 1. Rosenberg, P.E. 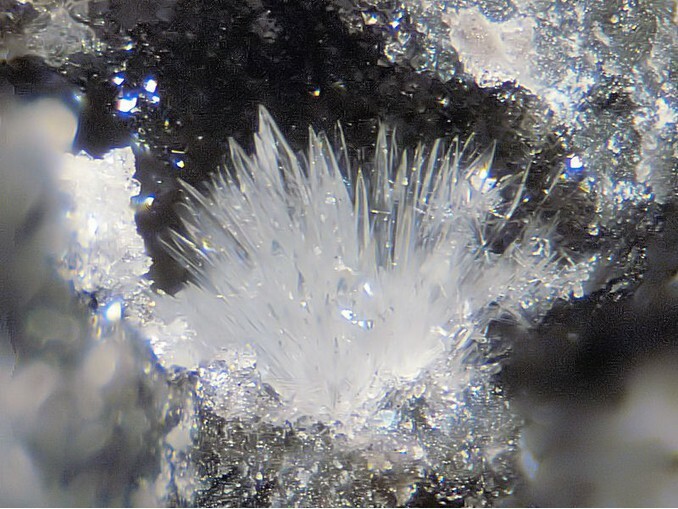 (1988): Aluminum fluoride hydrates, volcanogenic salts from Mount Erebus, Antarctica. American Mineralogist, 73, 855-860; 2. Ciriotti, M.E., Fascio, L., Pasero, M. (2004): Italian Type Minerals. Felici, Ed., Pisa, CD-ROM. 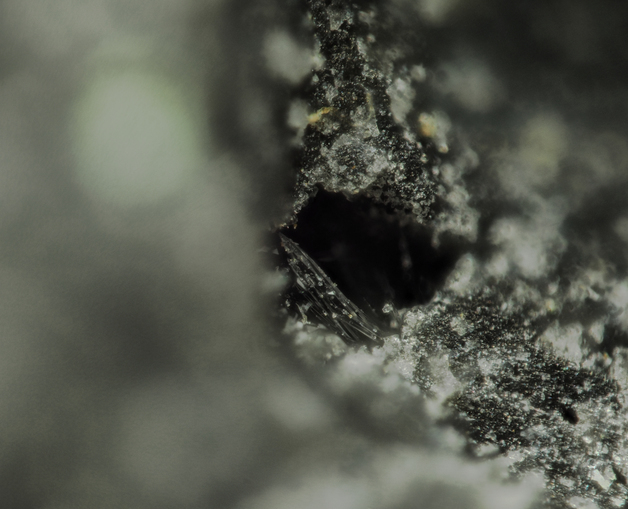 Collected and analysed by Günter Blaß; Witzke, T., de Wit, F., Kolitsch, U. and Blaß, G. (2015): Mineralogy of the Burning Anna I Coal Mine Dump, Alsdorf, Germany. Chapter 7, pp. 203-240, in: Stracher, G. B., Prakash, A. and Sokol, E. V.: Coal and Peat Fires: A Global Perspective, Volume 3: Case Studies - Coal Fires, Elsevier, 786 pp. European Journal of Mineralogy(1993) 5, 1167-1174; Menchetti, S., Batoni, M., Batacchi, C., Borselli, G., Brogi, A., Ceccantini, L., Fassina, B., Marchesini, M., Rossellini, A. & Ruggieri, G. (2015): Le Cetine di Cotorniano. Miniera e minerali. Associazione Micro-Mineralogica Italiana, Cremona, 354 p.